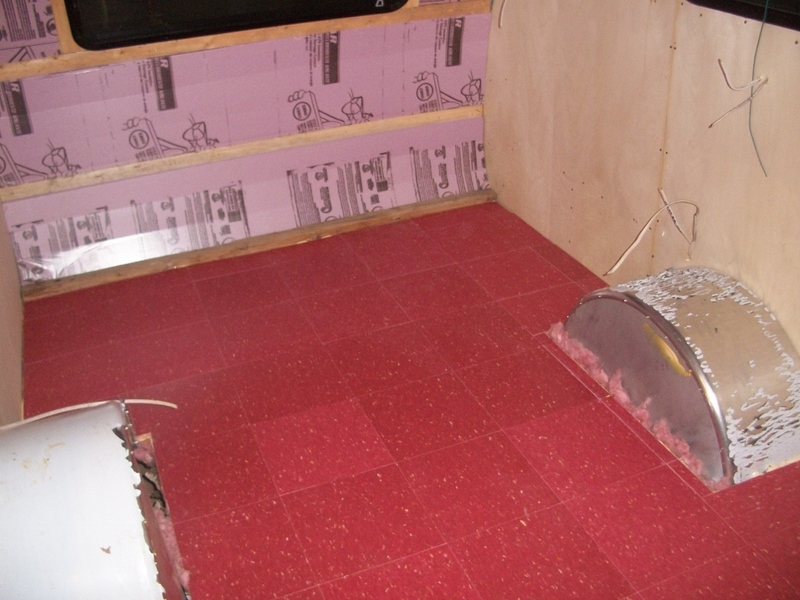 Here’s the flooring. 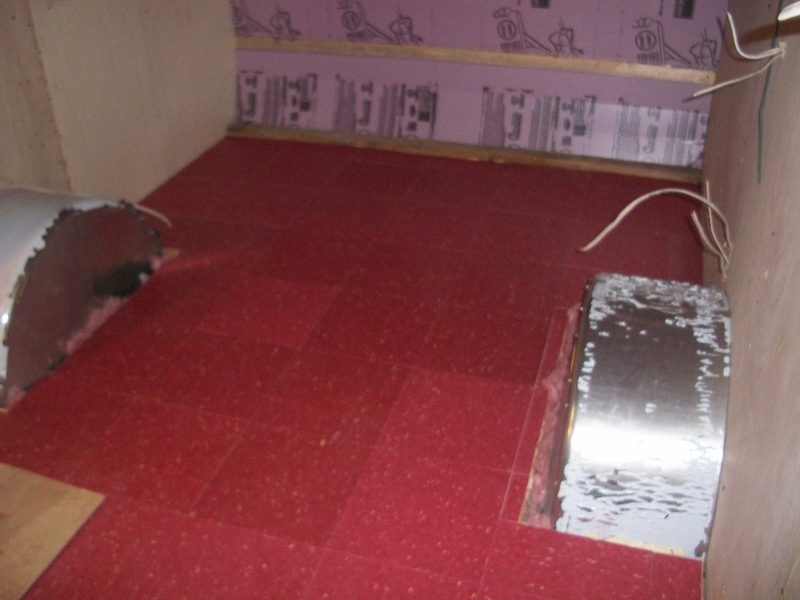 We had two boxes of tiles, same color but different color lots, so there is a little discrepancy. In the dim light from the trouble light I had hanging from the ceiling in the trailer, they looked the same, but in the light of day (or a flash) there’s some difference. Once the cabinetry is in, and the floor is polished, I think it’ll be fine. I did peel up one, but they do NOT like to let go once set and rolled down, and I decided it’d be better left alone. I’m afraid I’ll damage adjacent tiles trying to replace the light one sort of surrounded by darker ones. There’s always something. 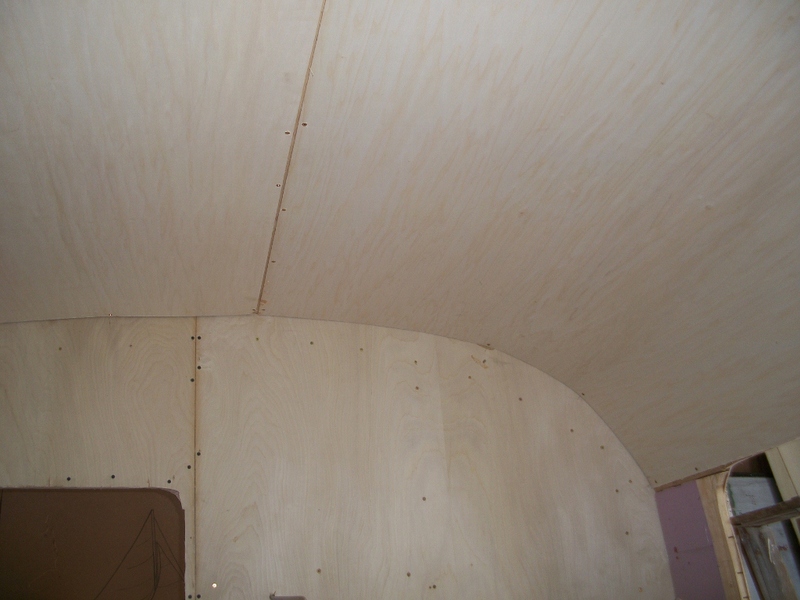 Today I started installing the ceiling paneling, and again, that was frustrating. We’d bought two rolls of red fender welting, intending to use it as trim between wall and ceilings as the original was. Trouble is, there is NO WAY to attach the welt, then install the ceiling panels, and then spring the panels past the welt. I tried for almost two hours to get the first panel, below the front window in, without success. So, I’m going to abandon that idea, and make some simple trim to finish the joint where the walls and ceiling meet. I did have to add one more stinger at the front in center of the curve above the window. The inner (ceiling) panel needed another attachment point. The outside skin bent around just fine, but it had the perimeter framing to mount to as well as the cross stringers. No problem. I’ll use the welt to trim the cabinets, bulkhead and closets, since we wanted the splash of color against the blond paneling, and may be able to incorperate it into the trim at the ceilings, so all is not lost. I am dissapointed I wasn’t able to figure out how to use it, but the way I’ve built the trailer, it’s impossible to do. It looks good and rustic-esque, which obviously is good for my teardrop, but probably would look out of place in your camper. However, I though by sharing this, it may spark an idea you might not otherwise had. Good luck Brian, I’m sure it will turn out as fantastic as your other endeavors. I think the way they did the welt originally was to assemble the sides of the trailer, staple the welt, then lay the roof on top of that. In the Serro Scotty’s that’s how it was anyhow…….. I used vinyl shoe molding in my 1972 Bell. You can read about my frustrations here: http://wp.me/p1ti83-6o There are alternatives. Look at Lowes or Home Depot in the vinyl molding sections. Thanks for posting all of this. I have seen about 3 other construction techniques online and I like this one the best. I have one question. Why does the outer roof skin go on before the interior ceiling skin? If you did ceiling first would that have allowed you to put in the gimp (welting)? To answer, because I didn’t know how to build it. The way I did the sidewalls, and put the cross stringers in, didn’t allow me to put the ceiling in first. If I’d laid the ceiling on the walls first, the stringers would have laid on top, and I didn’t think of that before I had it all done. 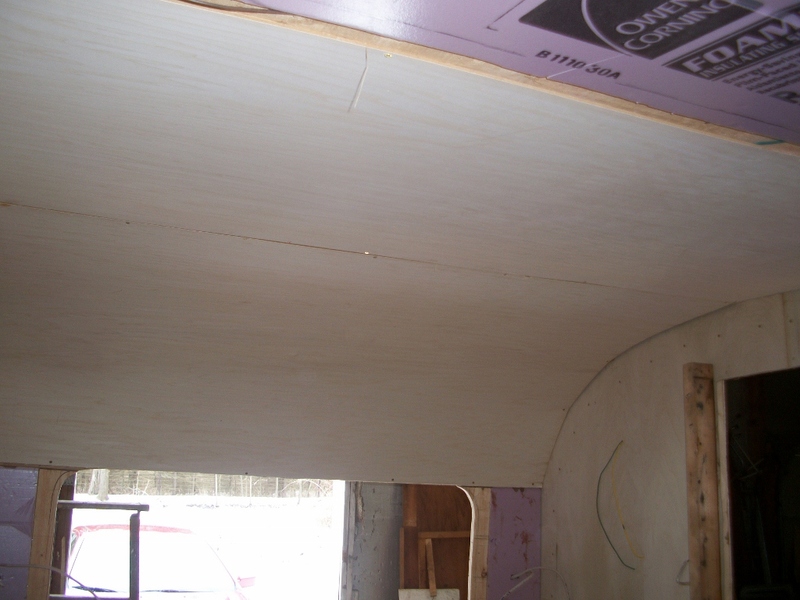 Know, having talked to a local fellow who’s building vintage style trailers, I’d have done a laminate sidewall frame that would have allowed me to lay out the ceiling, then drop the stringers on top, then skin the exterior. The way I did it made it a little tougher, and I couldn’t use the welting. Which is OK, I’ll use it for fender welt (which is what it is) for the Diamond T! The Tini-Home Chronicles: Interior paneled.